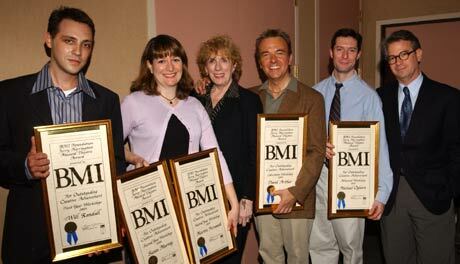 The BMI Foundation, Inc. recently celebrated the 2003 Jerry Harrington Awards at a reception at the BMI New York office. Winners were congratulated in recognition of Outstanding Creative Achievement in the BMI Lehman Engel Musical Theatre Workshop. This year's winners, chosen by the Workshop Steering Committee, include First Year student Will Randall, Second Year student Susan Murray, Librettists Group student David Arthur, Advanced Group student Michael Ogborn, and Second Year co-winner Martin Fernandi. Established through the BMI Foundation by Harrington's longtime friend and colleague, BMI Assistant Vice President and Counsel Evelyn Buckstein, the awards are given each year in Harrington's honor to celebrate the late attorney's lifelong love of musical theater. The BMI Foundation, Inc. is a not-for-profit corporation founded in 1985 to support the creation, performance, and study of music through awards, scholarships, commissions and grants. Support comes primarily from songwriters, composers and publishers, BMI employees and members of the public with a special interest in music. Because both the Foundation staff and the distinguished members of the Advisory Panel serve without compensation, over 97% of all donations and interest income are used for charitable grants. Contributions are tax-deductible to the full extent allow by law.